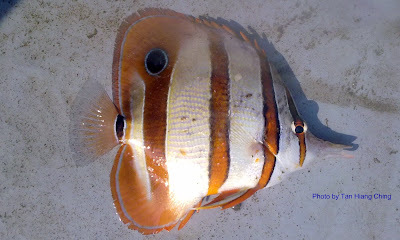 Butterflyfishes or chaetodontids are members of the Chaetodontidae family. They are mostly found on shallow coral reefs, lagoons and outer reef slopes to depths of 60 m or more. They can be recognized by having deep and highly compressed body, but without a strong spine at the preopercle. Almost all butterflyfishes species are very brightly coloured with complex and varied colour patterns. Almost all of the species eye is obscured within a dark coloured vertical ocular bar or dark region on the head. 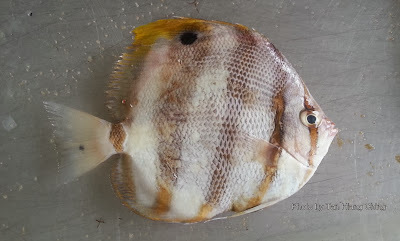 Many species with a dark occellate spot on the posterior portion of the body that resembles an eye. Butterflyfishes feed on corals and other marine invertebrates. They are rarely caught for food. The primary fishery value of butterflyfishes is through the ornamental marine aquarium trade. There are 12 genera and about 130 species of butterflyfishes worldwide. Malaysia is represented by 7 genera and about 44 species. Main Diagnostic Features: Elongated snout, orange bars and a dark occellate spot at the base of dorsal fins. Size: Maximum total length 20 cm. Main Diagnostic Features: Yellowish body with four dark brown bands. Dark blotch at the base of anterior dorsal fin. Size: Maximum total length 18 cm.